Combine cherries, berries, sugar and cinnamon in mixing bowl. Stir well to coat berries; add bread cubes. In another bowl, whisk together eggs, milk, vanilla and salt. 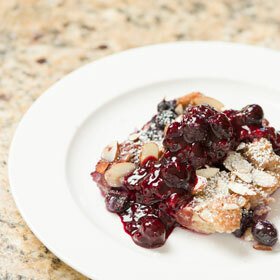 Pour egg/milk mixture over berry/bread mixture and stir to coat bread thoroughly. Let mixture stand for 15 to 30 minutes to enable ingredients to combine and the bread to soak up the egg mixture. Spray a 9-inch baking dish. Pour pudding mixture into baking dish. Remove from oven and evenly distribute almonds over pudding. Return to oven and continue baking until pudding starts to set, about 25 to 30 minutes. Remove from oven and let rest for 10 minutes. Garnish with powdered sugar. Serve warm. Thaw berries; save drained juice and mix with cornstarch. Cook berries over medium-low heat for about 3 minutes. Add juice mixture to berries and heat until thickened. Serve over or alongside pudding. Serving size: 1/6 of recipe. Amount per serving: 183 calories, 5g total fat (1g saturated fat), 27g carbohydrates, 8g protein, 3.5g dietary fiber, 248mg sodium.